Pricing for each circuit breaker is based on many factors including accessories, warranty and delivery options. Please call, fax or email with requirements for a specific quote. If you are unsure of what to provide, one of our sales engineers will be happy to help. Linkage for newer style round auxiliary switches for DS circuit breakers. Replacement filler plug for DS breaker faceplates when counter is not used. Priced per plug. Flash barrier for secondary disconnects on DS and DSII circuit breakers. Replacement latch check switch for DS circuit breakers. Newer style round auxiliary switch for DS circuit breakers. Newer style round auxiliary switch with linkage and cover. Includes instruction for use as replacement for older style rectangular switches. Secondary disconnect molding, reinforced to help eliminate problems with cracking and chipping. Designed to re-use existing hardware. Secondary disconnect molding reinforced to help eliminate problems with cracking and chipping. Includes hardware. Zinc plated metal mounting bracket for DS circuit breakers. Lifting assembly for use with overhead lift for removing and installing circuit breakers 3200 amp and smaller. Racking handle for removal and installation of breakers. New shunt trip frame with coil. Specify coil number or operating voltage when ordering. Replacement phase barriers with labels for DS, DSII, DSL and DSLII circuit breakers. Please specify model and size when ordering. Priced per set. 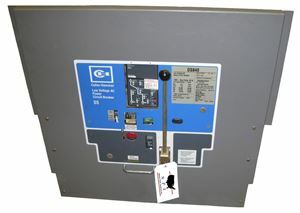 Universal lift yoke for removing and installing circuit breakers.